Do you know that there’s an easy way to update your Google+ account from your Gmail Inbox, yes from your Gmail account you can easily +1 the post, comments on the posts and share the post directly from your Gmail inbox. No need to install any third party application or any other chrome or Firefox addon on your browser to use this feature. All you have to make some changes on your Google+ account profile settings page and after that you will post or reply to comments from the Gmail window. Once you make some changes on your Google+ profile notification setting, you will get all the Google+ update on your email account , also you will receive the notification on your Gmail page, from there you can reply just like you would any other email. So lets take a look how this feature works on your Gmail inbox. 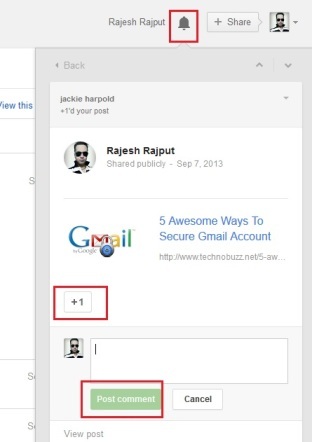 Once the notification is enable on your Google+ page, you will get all the new updated on your email box. From there you can plus one that post or leave a comment directly from the email, same like the email replies. Other way to post comment and +1 post is too via the notification icons from your Gmail account. Click on the Notification icon from the top right page of your Gmail inbox and here you will find all the notification form your Google+ timeline and leave a comment of +1 all those posted directly for your inbox page. If you want to create new post on Google+ or want to share some useful information on your Google+ profile, you can do the same directly from your Inbox page. 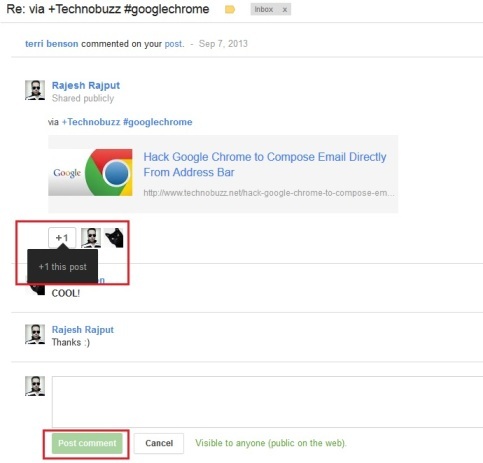 Click on the Share button from the top right corner of your Gmail page, next to your Google Profile picture. 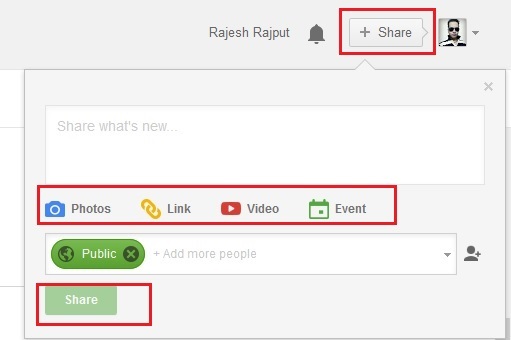 Now from here you can post the links, Photos, videos and send a direct message to your Google+ friends. with these above mention three way you can easily post anything on your Google+ page or leave a comment on your timeline posts directly form the Gmail page and without opening the Google+ profile on page. 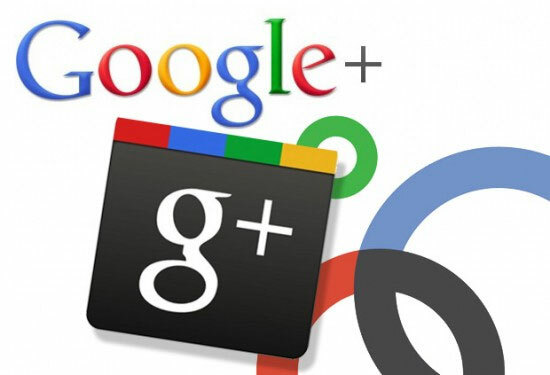 Looking for more tips on Google Plus, do check our Google+ section here! Being able to comment and +1 a post from gmail was amazingly useful however it now seems as if that functionality has been removed ( or at least I now cannot find it ). Any suggestions much appreciated. I still receive all the email notifications of posts but the only way to =! and comment is to open the post in a new tab :! !